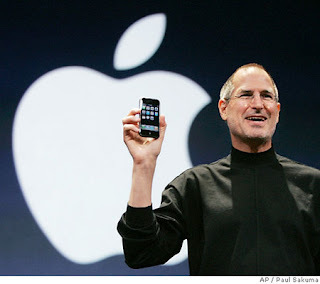 At the Apple press conference on July 16, Apple CEO Steve Jobs explains what is being done about the iPhone 4 and "Antennagate". First, iOS Version 4.0.1 has been released to fix a signal bar/meter issue and an email exchange bug. Second, every iPhone purchaser will be given a free bumper, i.e., a case, to correct the antenna problem that causes dropped calls. (CNET) Apple CEO Steve Jobs tells reporters that iPhone 4 antenna problems have been blown out of proportion, but to keep customers happy the company will give away cases and bumpers for the device. (CNET) Here is your iPhone 4 update! Apple addresses antenna issues in the iPhone 4 by giving away free bumper cases and allowing the penalty-free returns for 30 days after purchase. Natali Del Conte reports.